Full Peruvian - NGG ACCOYO ANTONIUS STRADIVARIUS is the herdsire for you if you are looking for a White, Full Peruvian, 100% Accoyo, Suri American Born Herdsire. Stradivarius has amazing dense very tight locks that are curly down to the skin and an impeccable conformation. He is a large Herdsire, but is easily handled, as revealed by his nickname, “The Gentle Giant." 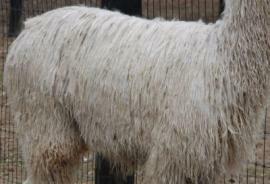 He is sure to enhance the fleece and luster in every cria that he sires. 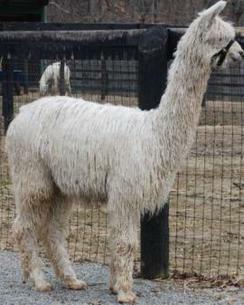 His dam is full Accoyo Ppperuvian Gardenia and she is another example of the fine luster and incredible locks which carry through to all of Stradivarius’ cria. Stradivarius' sire is full Accoyo Peruvian Ganador, a well known Full Peruvian Herdsire. 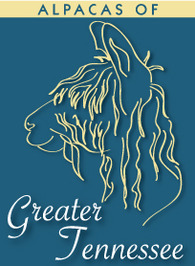 He has produced many show winning Cria with exceptional fleece and luster. His Offspring are 65% girls and has produced color when bred to color. Full Peruvian - Kalin is a beautiful young full accoyo female. She is extremely dense with beautifully locked lustrous fleece. Kalin is a big solidly built girl with perfect conformation. As for coverage this girl is covered from head to toe in beautiful fleece. Kalin possesses a beautiful and very distinct accoyo head. Kalin's impeccable accoyo bloodlines include Jackpot, Montoyo (Ramilo)and Torbio. Her dam Kasa, is without a doubt one of the finest full accoyo females in the country. Assessed by an outside alpaca consultant; the comments to describe Kalin included “elite, beautiful, wonderful stock for the foundation herd”. When placing Kalin at a show, Judge Kristin Buhrmann comments included “exceptional…….high quality foundation female”. Cari is a Full Accoyo white female. She has dense fiber with consistant lustrous locks and good coverage. She is also big boned with perfect conformation. Her sire is NGG ACCOYO ANTONIUS STRADIVARIUS. STRADIVARIOUS's genetics are somewhat rare being out of PPERUVIAN GANADOR and PPERUVIAN GARDENIA. Her dam is PCAF ACCOYO KALIN. KALIN's sire is HHSF PERUVIAN MONTOYO who is out of PPERUVIAN RAMILO. KALIN's dam is PCAF ACCOYO KASA. KASA's sire is CPERUVIAN ACCOYO JACKPOT and KASA's dam is DPA KATRINA who is out of PPERUVIAN TORBIO. Cari sells with her first breeding to any of our males.